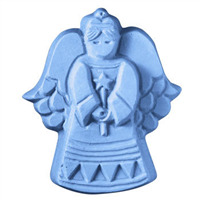 This sweet Angel Soap Mold is perfect for Christmas, holidays, and any time you need a guardian angel to help protect and guide you. 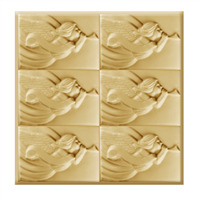 The Tray Angel Soap Mold features a cherubic face and makes nine square soaps. The Angel with Trumpet Tray Soap Mold features an intricate angel that appears to be gliding through wind as she blows her royal trumpet. 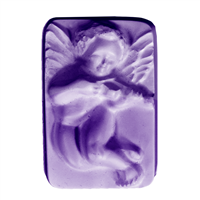 Tray Cavity Dimensions: 6.5" x 6.5" x 1.25"
Make angelic and spiritual bars of soap with this adorable cherub mold. 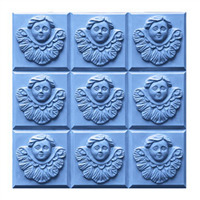 Use this mold when making soap for a church fundraiser or perhaps Sister soapmakers will like it for their holy soaps. Bar Depth: 1 Bar Length: 3"